The Miner Family Winery is located along the eastern hills of the Oakville appellation in California, USA. In this three-for-one review, we’ll be tasting three of Miner Wines’ top selections. We’ll start with the Miner Family Winery Wild Yeast Chardonnay 2012. From there we’ll move on to a selection called Garys’ Vineyard Pinot Noir 2014. Finally, we’ll round out our tastings with the Miner Family Winery Stagecoach Vineyard Cabernet Sauvignon 2013. Samples received of all three wines for review purposes. 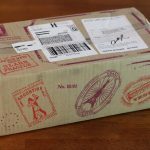 If Stagecoach Vineyard sounds familiar, it may be because I reviewed the winery’s Stagecoach Merlot previously. 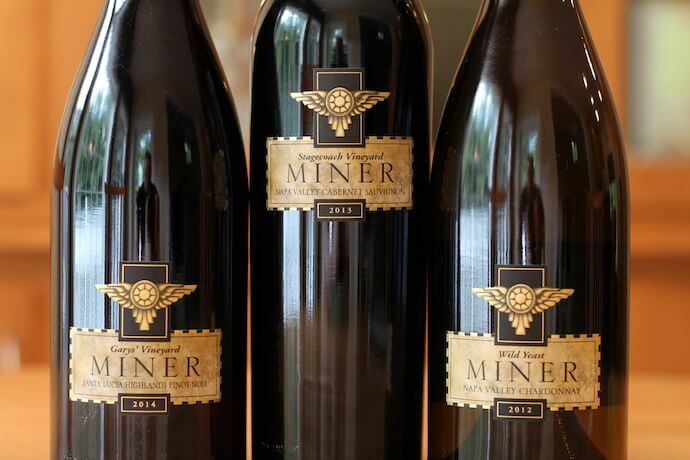 I thought it would be nice to review all three of these wines together to get an overall feel for the wines the Miner Family Winery produces. For these reviews, I had help from my friend Big Al, who’s been a guest taster before and always provides a trusty palate. According to the tasting notes, this wine’s grapes were fermented using only the yeast cultures found on the grape’s skins, in the vineyards and within the confines of the winery itself. The wine is 100% Chardonnay and 100% barrel fermented. In the glass, we found this wine to be light honey in color with some muted brassiness. Legs were numerous, widely spaced and very slow to fall. We both agreed the wine presented aromas of florals and citrus. I noted the aroma to be very clean, with grapefruit and lime. Al uncovered what he called a spicy cinnamon sensation. Neither of us noted a significant alcohol burn with this wine. Miner Wild Yeast Chardonnay alcohol content 14.2% per the bottle. When we got to the wine’s taste, our opinions began to differ. I described the flavors as light and liquidy, with very muted citrus. While I did like the flavor, some might call it a bit washed out. Al found the flavor a bit too light for his taste. I found it light and enjoyable, however Al noted a bit of bitterness he wasn’t fond of. Overall, we split the difference on this one. I enjoyed the wine’s lightness, however Al gave it a pass. Miner Wild Yeast Chardonnay suggested retail price $50.00. 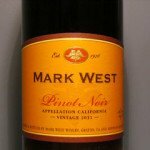 The grapes for this wine were planted by two friends, Gary Franscioni and Gary Pisoni, which explains why this wine is called Garys’ Vineyard. The wine is 100% Pinot Noir and was aged for 15 months in 60% new French Oak. In appearance, this wine had a unique light ruby and cherry look to its color. You might even say it had a red metallic look to it. Lots of light shines through. It had little to no opacity, though it did leave lovely red reflections on the table. It also had lots of quick falling legs that were tightly packed. The wine’s aroma turned out to be our favorite part. We both enjoyed it a lot! We noted cherry to black cherry, a hint of currant, wood smoke, and earthy mulch. Additionally, there was not much of an alcohol burn to it. Miner Garys’ Vineyard Pinot Noir alcohol content 14.2% per the bottle. Overall, the wine’s taste left us wanting more as it was quite light in flavor and a bit too bitter for Al. We did note some red fruits at first sip and some fruit tea towards the end. Mouthfeel was like a light juice and tannins were supple. Finish was long and carried by the flavors. Hardly any tannins noticed. Again, very light. Overall, I described it as an elegant, albeit light, Pinot Noir that goes down easy. Al’s opinion differed. He felt it lacked in agreeable flavor. Miner Garys’ Vineyard Pinot Noir suggested retail price $60.00. 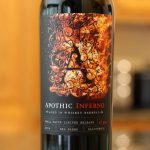 This wine is actually a blend of 90% Cabernet Sauvignon, 6% Merlot and 4% Cabernet Franc. And finally, Stagecoach Cabernet was aged for 21 months in 60% new French Oak. 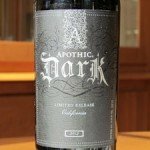 We found this wine to be very dark, with little to no light shining through. Its color was best described as opaque Burgundy. Legs were quick falling and came in multiple layers. When the glass was given a tip or a swirl, we saw that this wine really coats up the glass. Similar to the previous wine, we found the aroma of this wine to be full of expression. 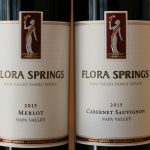 We noted brilliant florals, cinnamon, dark spice, nutmeg, minerals and even grape jelly. We summarized it as “Apple Pie spices” and the wine’s alcohol content did not capture our noses’ attention. Miner Stagecoach Vineyard Cabernet Sauvignon alcohol content 14.4% per the bottle. The wine’s taste was easy to describe. We called it a combination of currant and black fruits. Mouthfeel was cottony and we noted what we called “Kickin'” tannins that were very present all over the palate. Unfortunately, those tannins really over-dominated the finish. While the length of the finish was medium, the flavor almost immediately gave way to the tannins. No balance. Overall, while we found this Cabernet to be OK, we weren’t left with anything overly memorable about it. I think we were expecting more for the price. 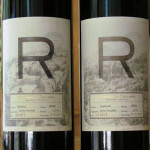 Miner Stagecoach Vineyard Cabernet Sauvignon suggested retail price $75.00. In general, we were looking for a little more agreeable flavor from these wines, but each of these wines ended up being a bit washed out. I think where they really stood out was their aromas, which were incredibly unique in some cases. Since our tasting, I’ve checked out other reviews for these wines. Others have given them very high marks. 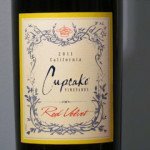 So, consider our review among many when deciding whether to give these wines a try.